Kale Köy was the ancient Lycian town of Simena and is very picturesque, dominated by a Crusader castle, necropolis and submerged tombs protruding from the water. It needs to be approached with care because of the numerous reefs. The bottom is mud and weed over rock and does not provide secure holding. It is better to either anchor inside Uçagiz Liman and visit by dinghy or to berth alongside at one of the three 50-metre long pontoons provided by restaurants. Each can accommodate 2 to 3 yachts on either side of their pontoon. Depths range from 4.5 to 12–14 metres.. There are shallows about 20 metres west of the pontoons, which need to be avoided when berthing. The medieval castle at the top of the village and the ancient theatre inside are well worth the climb. The necropolis a few hundred yards to the east of the castle is also worth a visit. There are a number of intact Lycian tombs in an impressive setting overlooking Kekova Roads. 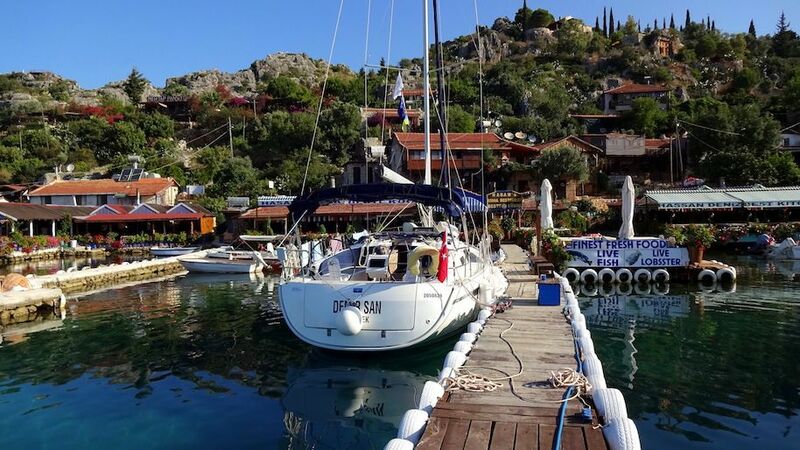 If berthed at the pontoons, it is an 800 metre dinghy trip over to Kekova Island to visit the stunning ruins of the ancient Lycian city on its north shore. Once the day tripper boats leave by 18:00, Kale Köy reverts to a charming Turkish fishing village.